Congratulations Emirates Team New Zealand!!! We were very happy to assist with transport for the Christchurch parade yesterday. Lucky Daryl (our lead driver - South Island)! Look at what he got his hands on while escorting the team down south.....percs of the job! Convene South 2015 was held in the Wigram Air-force Museum, Christchurch, on September 1st. 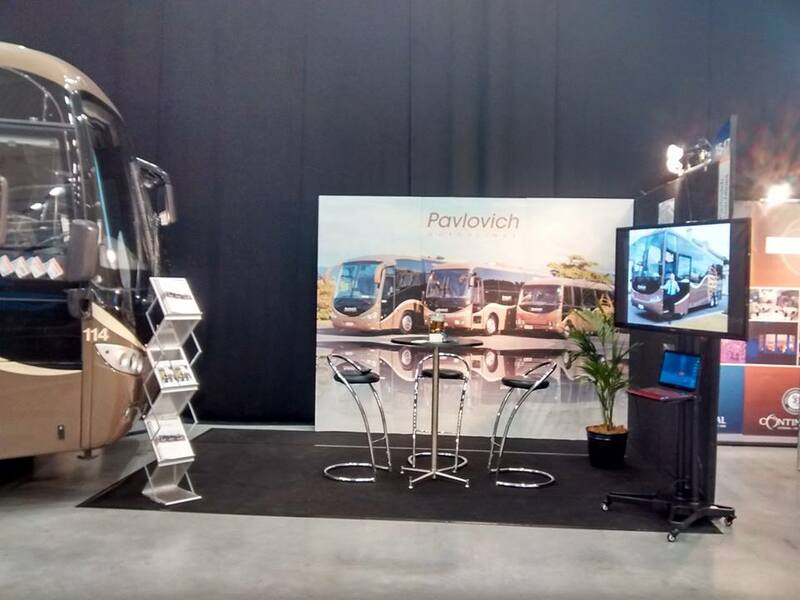 Buyers were able to experience what the region had to offer and were introduced to our new 33 seat coach, parked on our stand. First Coach company in New Zealand to launch Greenroad. We look at a few different paths to fuel saving and efficiency. As a number of operators are finding, what started as an exercise in fuel efficiencies is having a number of other positive outcomes. When Bernard Pavlovich of Pavlovich Coachlines first started looking at a GPS system that monitored his drivers, he initially thought it was all about fuel saving and nding speeding drivers, but he soon discovered it was more than that. “€ere was subtle shi to the realisation that it was not about that, it was about customers sitting on buses. At that point the whole thing changed." 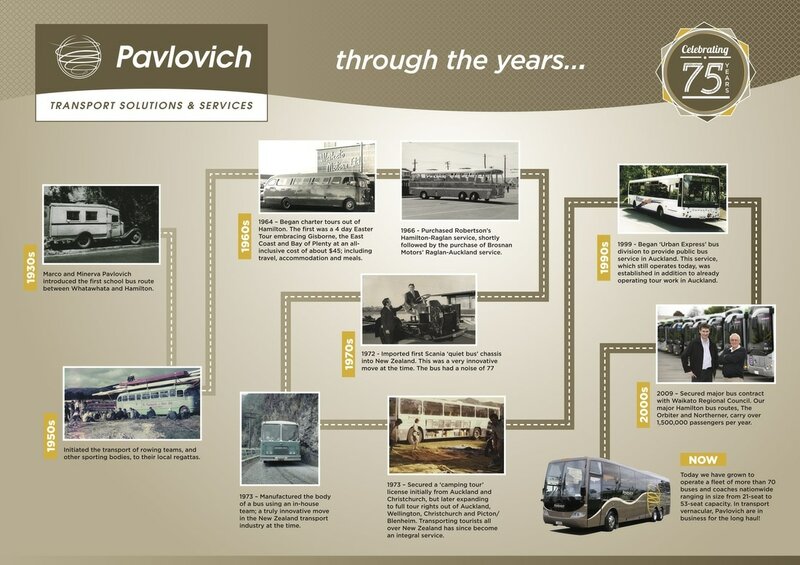 Early last year Pavlovich became much more aware that everyone was moving more in the telematics space. In the middle of last year they sent out for expressions of interest. €They got about five responses, but discovered there were probably about 25 people selling telematics systems. Many of them though were truck oriented. “What we thought we had embarked on, a solution to improve fuel e‚ffciency and reduce our costs, we soon realized was actually about finding a customer-centric solution. “We thought it was wholly a cost-saving exercise, but we realized this was a huge opportunity to provide a tool for our drivers to make a much better customer experience. We knew we could achieve that if we had drivers who were suddenly driving better, giving our customers a more comfortable ride and feeling safe, then all those cost saving effƒects were going to come anyway, so we had a major change of mindset. “We had plenty of suppliers talking about fuel consumption and reduction of costs, and better eff‚ciency. One supplier said: ‘We can get your business performing safer, we can get your customers a more comfortable ride and feeling safe, then all those cost saving eƒffects were going to come anyway, so we had a major change of mindset. Driver buy in is very important and Pavlovich, aware of this, are implementing very slowly, benchmarking across the whole fl„eet. Th€e information they get is a driver score every day from his or her shift. It’s a safety score. €The driver is measured on speed, control of the motor vehicle, ability to stay in his lane, and measuring any harsh braking, all those things go into an algorithm and produce a score that says you are either 99 out of a hundred, which means you are a terrible driver, or you are one out of a hundred which means you are a fantastic driver. Realistically, says Bernard, when they started they were seeing high scores, but they are confident they will come down dramatically. Howick and Eastern have been using a telematics system for 12 months now and chief operations offi‚cer Troy Odea says he would not now be without it. Diffƒerent operators are finding that diƒfferent systems suit their needs best. Ritchies Buses have been trialling another telematics system, EROAD and according to Ritchies chief executive Andrew Ritchie they are very pleased with the results and are seeing a great improvement in driving skills and effi‚ciencies. Whatever the system, all operators Circular spoke to were positive about the telematics eƒect on their drivers, customers and overall operation. According to Troy ODea when they went into telematics they were “horrified”. Th€ey had thought their drivers were pretty safe – the telematics system showed up areas they weren’t seeing that they needed drivers to pick up. Souter Holdings Group installed telematics through its entire „fleet at H & E, Mana, Manabus.com and Waiheke buses. “We have seen an 81% drop in speeding infringements from the police. It’s huge. €That was one of the scary things for us. It has been dramatic the change around, we get a speed report every day and we are able to go to the driver and say ‘did you realise?’. Also it helps when a driver goes on to a new or unaccustomed route, there will be transgressions and we can pick them up. According to Troy the telematic system says the fuel savings can be up to 10%. He says initially they had not focused on that as such. “When we first put the system in place we looked at the safety score and realised that we were not as safe as we thought we were. We have spent the last 12 months focusing on safety and ensuring drivers are reaching targets, then from safety we have just started looking at the economic savings. “We are not dealing with accidents, damage to other vehicles, it’s greatly reduced our spending in those areas. And how has the driver buy-in been? According to Troy there are three groups of drivers. Some drivers will resist, some are 50/50 and there is a group of drivers who follow the system without fail. “We found these three groups; we spend a lot of time getting the drivers’ buy in, a telematic system is not going to work without the drivers’ buy in, they need to understand it is as much for them as it is for the company, and probably more. At H & E it has got to the point the competition is fierce between drivers to see who is the top dog. “I have drivers that are upset because they are not the top dog and yet they are driving on a one. Th€e competition to be a better driver is fierce! I have about 40 drivers in the GreenRoad 1–6 area, fighting to be top dog. Specific driving behaviours and manoeuvres cost your company dearly in fuel consumption, collisions, insurance premiums, wear and tear on vehicles, and importantly, reputation. Idling and personal use of company vehicles and fuel can also take a sizeable bite out of your bottom line. Most importantly, with up to 90% of accidents caused by drivers, improving driving behaviour can save the lives and limbs of your drivers, passengers and others with whom they share the road. Safe driving is socially and environmentally responsible as well as fuel efficient. By reducing risky behaviours such as sharp breaking, rapid acceleration and high speed driving, your company can establish real environmental bona fides by decreasing emissions by up to 33%, lengthening vehicle lives, and reducing fuel use. To be successful, changing driver behaviour must be a structured process that has buy-in from your drivers and is based on reliable data and insights that both they and their managers can act on. GreenRoad Driver Behaviour System was purpose-built to facilitate deep, lasting change, incorporating real-time in-vehicle feedback, advanced fleet analytics and reporting. Effective educational tools help drivers internalise safer, more efficient driving behaviours. to work on and provide tangible evidence that reinforces improvement. Fleet and operation managers must balance a huge number of factors to make sure that passengers are safely transported to their destinations comfortably, on time, and on budget. Customisable GreenRoad alerts for safety issues, excessive idling and out-of-range vehicles enable management by exception, without adding additional report-checking to managers’ to-do lists. Significantly lowering fuel costs for your fleet is simpler than you think, and does not require costly capital investment. In fact, the key is sitting right in the driver seat of your busses and coaches! Empowering your drivers to develop safe, environmentally sound and cost-saving driving behaviours is a win-win proposition that benefits your company, its drivers, passengers and the community at large. 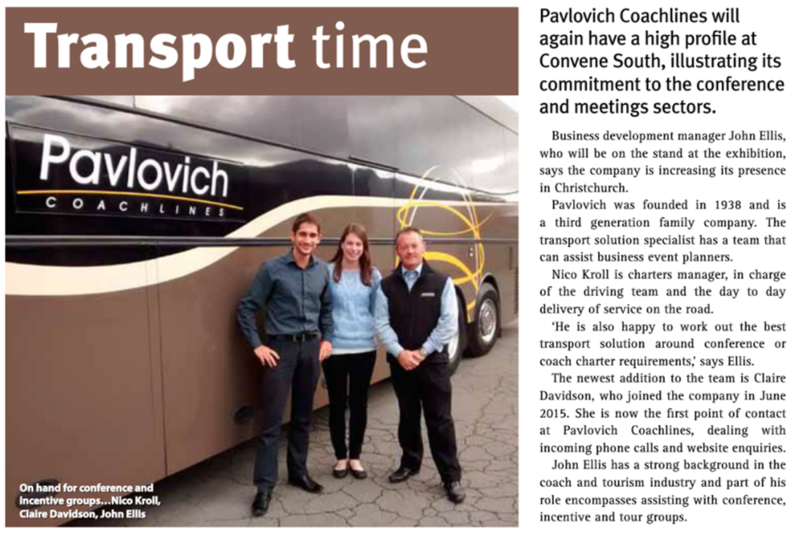 After spending virtually all her life in the Australian Bus and Coach industry, Skey Naismith has moved accross the ditch and is now working with Pavlovich as Group Operations Manager. contract for urban and school services in 2004, Mt Gravatt Coach and Travel evolved from a ‘family’ business to a professional, accountable delivery partner. 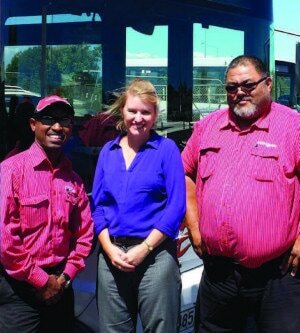 Skye Naismith with Pavlovich Urban Express drivers Amaniel and Mike. When she left Australia in 2014 Skye received an industry award from the Queensland Bus Industry Council. The award was presented by QBIC Exec Director, David Tape and QBIC Vice President, Rolf Mitchell. Skye has only been at Pavlovich for few months now, but already feels she is settling in and is happy to be living across the ditch. 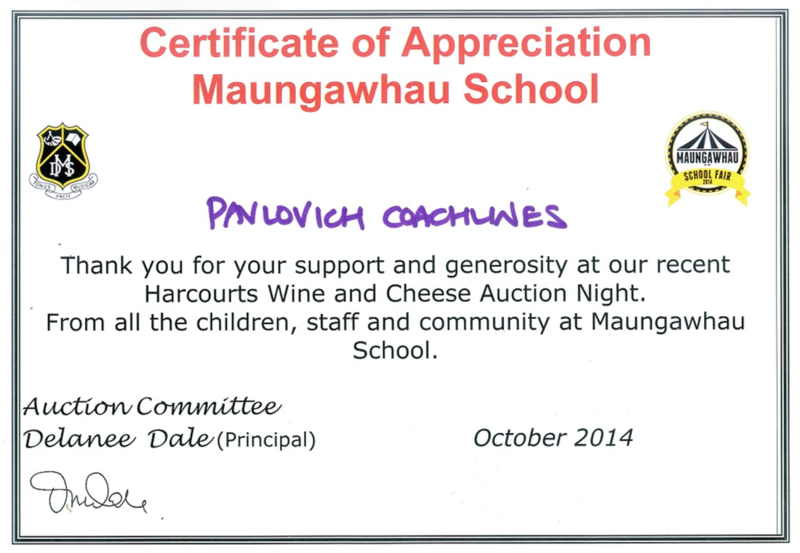 September 2013 saw Pavlovich contracted by The New Zealand Defence Force, to provide coach transport to the Pacific Armies Chiefs Conference and Pacific Armies Management Seminar. Fixed pool of approved drivers used…..
A measure of our clients satisfaction can be viewed below. In building a successful business, our suppliers are crucial in providing us with the ability to ensure we can deliver the best choices to our customers. Scania and Pavlovich, have built a relationship since 1972, this relationship is supported in New Zealand by their agents, Cable Price. Read this article, released in their customer magazine in June 2012. We had a lot of fun in the last week of May, as Auckland hosted a visit from the new Boeing 787 “Dreamliner.” Touted by Boeing throughout its long gestation as a new benchmark for fuel efficiency and design, Auckland turned on near perfect weather and flying conditions. Pavlovich crew enjoyed the opportunity to get up close and personal with not just the star of the show, but an interesting array of people from Boeing HQ in Seattle. Tasked with providing transfers for flight crew, a marketing team and some VIPs, we ensured that all the entourage were well looked after in Auckland. 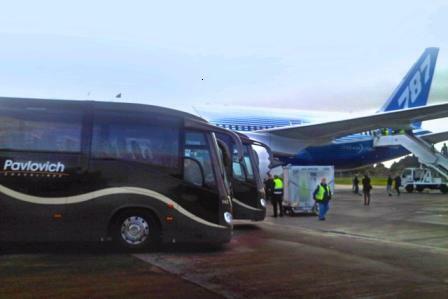 We thought, the combination of th new 787 and our fabulous looking Irizars was just right.